1. In 1864, S. E. M. Duruy, Minister de l'Instruction Publique and Président de la Commission Scientifique du Mexique, had black-and-white photos of the Paris Codex (then described as the "Manuscrit dit Mexicain No 2 de la Bibliothèque impériale") printed (in Paris). Few copies of this edition were printed (probably somewhere between 10 to 50); it is now quite rare indeed. However, copies of these photos appear with Gates' 1909 rendition, with the Graz 1968 rendition of the Paris, and within the republication set of the Paris Codex produced by Ecological Linguistics (2001). These comprise the earliest photographic record we have of the Paris. 2. Léon de Rosny, in 1887, had printed a chromolithographic version (of 45 or 85 copies) of the Paris Codex. Since that is the version that Graz used in publishing its facsimile in 1968 (with an introduction and summary by F. Anders), it has become one of the most used versions (indirectly at least) of this codex. The Graz version in turn was used as the basis for the Chiapas version (Thomas A. Lee, Jr., "Los Códices Mayas", 1985). Color renditions of the codices are not only beautiful to look at, but also are of importance in understanding more about the Maya through their art, and their mathematical calculations. Note that red numbers and black numbers generally have different significance: the red giving the dates, the black giving differences between dates. Nearly all zeros are written in red. Unfortunately, the lithographer, apparently trying to do some touch-up work on the Rosny 1887 version of the codex, did not do a perfect job, so the accuracy of this edition (and therefore of the later Graz and Chiapas editions also) has been compromised. This is too bad, for other than the rather stylized Gates' version, this is the only color version of this very fragile codex ever printed. Nevertheless, it is quite helpful that the Graz edition comes with an explanation of some of the differences that have been found between the Rosny color version and the photographic versions. 3. In 1888, Rosny had another printing of the Paris published. It was in black-and-white, from photographs, which were apparently unaltered. One hundred copies were issued. This has an excellent reputation; I have not seen it. 4. In 1909, William E. Gates published 57 copies of his facsimile version of the Paris Codex. Like his version of the Dresden, Gates Paris Codex is very pleasing to look at, and uses his own font. He has done a little bit of reconstruction, i.e., some numbers and other glyphs are put in although they had already been destroyed by 1909. (My personal opinion is that Gates has through the years gotten a fairly bad rap. I doubt that he was very good with people, and this may have affected our view of him some). Obviously, if he made up his own font for the glyphs, and even if only rarely reconstructed some portions (without hachuring or dotted lines), he was only asking for some inaccuracies to creep in. Therefore, for a lot of work, his special-font versions should not be used without checking photos first, and he did include copies of the Duruy 1864 photographs with his facsimile. His rendition of the figure in the upper right corner of page 3 of the Paris is better than that of the 1887 Rosny (and therefore the later Graz and Chiapas) editions, where much of the figure is missing (though present in photographs). 5. Theodore A. Willard in 1933 had published a black-and-white photographic facsimile in "The Codex Perez: An ancient Mayan hieroglyphic book" (Arthur H. Clarke, Glendale, California). This is the version used in Luis Azcue y Mancera's "Codice Peresiano" (Editorial Orion, México, D. F. 1967). Willard's version (and therefore Azcue's also) has some sort of enhancement done, so that it appears a bit like a black-and-white line drawing. Some reconstructions, with dashed lines, and some touch-ups are included. In the touch-ups, at least one error was made: for instance in the orientation of (what was originally) the green or blue "12" on page 24. The library at Northwestern University of Illinois has made this rendition available online at: http://digital.library.northwestern.edu/codex/index.html. 6. No discussion of the Paris Codex is complete without mentioning Bruce Love's work, "The Paris Codex: Handbook for a Maya Priest" (University of Texas Press, Austin, 1994). In it are excellent black-and-white photos of the Paris Codex. (Surprisingly, one is marred: the middle section of page 24, around the region of  K'an is imperfect). Some of these photos came from Bibliothèque nationale ektachromes. I do not have an exact date for these ektachromes, but since ektachromes were not produced until 1942 or later, the Bibliothèque nationale ektachromes could not have been made before that, and probably were not made before 1950 or so. In any case, these black-and-white photos have now become probably the most used rendition of the Paris, especially for those studying its glyphs. To view photographs of the Paris Codex from the Bibliothèque Nationale de France, click here. 7. Hannelore Treiber wrote a work entitled "Studien zur Katunserie der Pariser Mayahandschrift", which was published in 1987 as Volume 2 of Acta Mesoamericana; it has black-and-white photographs of the first half of the Paris Codex which have a very fine reputation. It has been available via Verlag Anton Saurwein by contacting publisher@mexicon.de (ISBN 3-924332-03-7). 8. An incompleted work of the Paris by James B. Porter appears on an archived website, at http://web.archive.org/web/20030827025822/http://mayaglyphs.net/paris/paris.html. Here he has drawn a reproduction, using both the Graz 1968 edition and the Gates' edition with photographs as guides. Porter has attempted a rather extensive reconstruction (often shown with hachured lines), which, along with Gates' rendition, makes one question some papers that have been published about the Paris, especially when these papers have made differing assumptions about the missing portions of the pages. This prodding in itself I feel is a good contribution to our study of the ancient Maya. 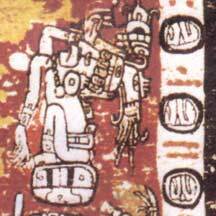 The codex itself is now catalogued as Fonds mexicain, No 386. For many years it was said to be kept in a sealed wooden box, with a glass cover that permitted only two of its pages to be seen. By December 2007, this was no longer the case; researchers no longer were seeing it kept in this box (personal communication of October 8, 2011: Harvey M. Bricker). Since the codex itself is in such a fragile state, it is not generally available to the public. In the event that one wants to see more detail than that which is available from the Rosny and Rosny-derived color editions or from the excellent black-and-white versions that have been published, excellent digital images of very high resolution can be purchased from the Bibliothèque nationale de France (BnF). Randa Marhenke shares pages that were taken from the Codex Peresianus that were included in Léon de Rosny's "Atlas" of reproductions, which was in his Archives paléographiques de l'Orient et de l'Amérique. This was published, with the date of 1869 on its title page, by Maisonneuve, Paris. The Peresianus pages were grouped together starting with one labelled "Manuscrit yucatèque No. 2 de la Bibliothèque nationale (inédit)". Peresianus pages 5-22 were shown in the Atlas (in plates 117-132), and are thus included here. Pages 1-4 and 23-24 were missing from the Atlas, and are thus missing from this collection. Click here to read more about Léon de Rosny's Peresianus of 1869. In 1859, José Pérez published, in a journal edited by Léon de Rosny, a short article about the Paris Codex entitled "Sur un ancien manuscrit américain inédit". In this article, he described the Paris Codex as being of the same "genre" as the Dresden Codex, and included one or two drawings of one or two pages from the Paris Codex. This turns out to be one of the earliest renditions of any part of the Paris Codex. To read more, click on the article here José Pérez and Sample Peresianus Page(s) of 1859. The earliest known set of drawings of the Paris Codex, possibly dating from around 1835, are attributed to Agostino (Augustine) Aglio. These drawings are now lost, but lithographic prints of them are located at the Newberry Library, Chicago. To learn more about these prints, and Kingsborough's Antiquities of Mexico, click here The Aglio-Kingsborough Paris Codex.